Despite operating in one of the most tightly controlled media environments in the world, Chinese journalists sometimes take extraordinary risks, braving the perils of job loss or imprisonment to report sensitive stories. As a result, a group of journalists stands at the forefront of some of China’s most dramatic social and political changes. This book is the first to systematically explore why some Chinese journalists decide to challenge Communist Party power holders and the censorship system. 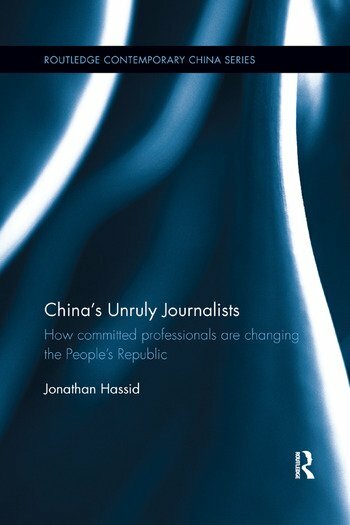 Based on 18 months of fieldwork, interviews with over 70 Chinese journalists and academics and analysis of nearly 20,000 Chinese newspaper articles, it investigates the motivation behind news workers who often brave the perils of challenging an authoritarian system. Rather than being driven by commercial pressures or financial inducements, the book suggests that many aggressive journalists push the limits of acceptable coverage because of their sense of public spirit and their professional role orientation. It argues that ultimately, these advocate journalists matter because they challenge specific policies and are changing China, one article at a time. By investigating these path-breaking journalists, the book engages with literature across the social sciences on contentious politics and social movements, political communication, media theory and the sociology of professions. Therefore, it will be of great interest to students and scholars of Chinese Studies, Politics and Media Studies. Jonathan Hassid is an Assistant Professor in political science at Iowa State University, USA.